Though the tomatoes and melons of this season are still in full force and the fall bounty is yet to come, it is time to daydream about 2014. The UVM Farmer Training Program is now accepting applications until October 31 for early admission to the 2014 cohort! (After that admission will be rolling until spots and the waitlist are filled.) Apply now to join an incredible group of students for six months of sustainable farming and food systems education. 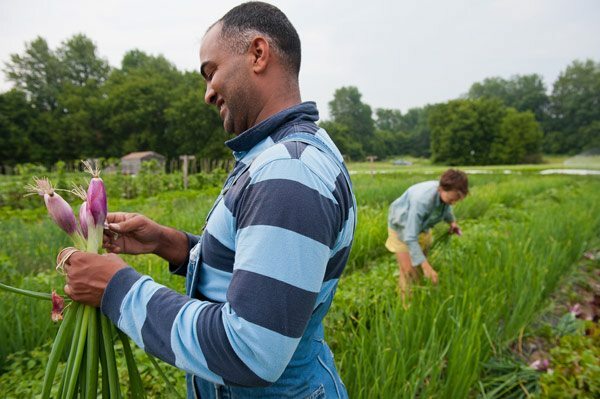 The UVM Farmer Training Program is a 6-month intensive program (May 5 -October 31, 2014)for aspiring farmers and food systems advocates that provides a hands-on, skills-based education in sustainable agriculture. This full-time program offers participants the unique opportunity to manage their own growing site, take classes from professors and expert farmers, and rotate as workers and learners on successful, diverse farms in the Burlington area. This program will provide an intense, supportive experience where participants leave with a Certificate in Sustainable Farming, a deeper understanding of agricultural management and small-scale farming, and the entrepreneurial skills to start their own operation.